Here is another Do-It-Yourself idea for your wallpaper leftovers. Cut a 4-6 cm wide piece from your favourite wallpaper leftover. Fold it several times in 8-10 mm folds like an accordian. Fix the ends together with hot glue and glue on a button in the middle. 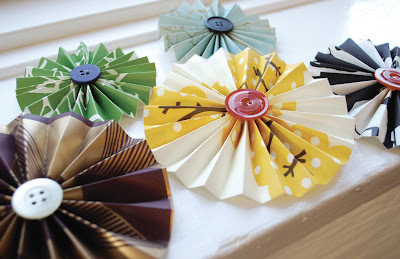 Theese cute rosettes are perfect as brooches, hair decorations, napkin holders etc. Your imagination is the only limit.